Do you get “hangry?” I do. I’m not a nice person to be around when I’m hangry. Peaceful family walks in cute new locales to “check out lunch options” turn into practical emotional breakdowns if there is any delay in getting food in my belly. My husband had to have a heart-to-heart with me one day when I lost my marbles trying to find a brunch option in La Jolla. He told me that I needed to grow up, realize that I had a problem, and do something about it to prevent it from happening in the future. He told me that I was ruining our family’s good time. Grudgingly I admitted that he was right. Fortunately we found a place shortly thereafter and I was able to soothe the savage beast. I vowed to change. The answer was nuts. Since that day I’ve started keeping an assortment of nuts with me and I bring them along everywhere I go. I’m like a squirrel. I have nuts hidden everywhere. I have them in my car’s driver’s side door for quick access during traffic jams. I keep them in my work bag and pop a handful in my mouth when my mind starts to overload with emergent, life threatening decisions but my grumbling stomach is all I can concentrate on. I bring them in my purse to back-to-school nights and work meetings and conferences. You can be sure that I keep them in my carry-on on plane flights. I have learned to tame the hangry monster within and I feel like a nicer person because of it. It turns out that not only are nuts portable, tasty, satisfying, convenient, have a long shelf life, and are TSA-approved, they help you lose weight, live longer, and be healthier with everything from cardiovascular disease, to diabetes, to cancer, to strokes. The best part is that it doesn’t even matter which kind of nut you prefer. They all help. How is this possible in such a delicious, convenient package? 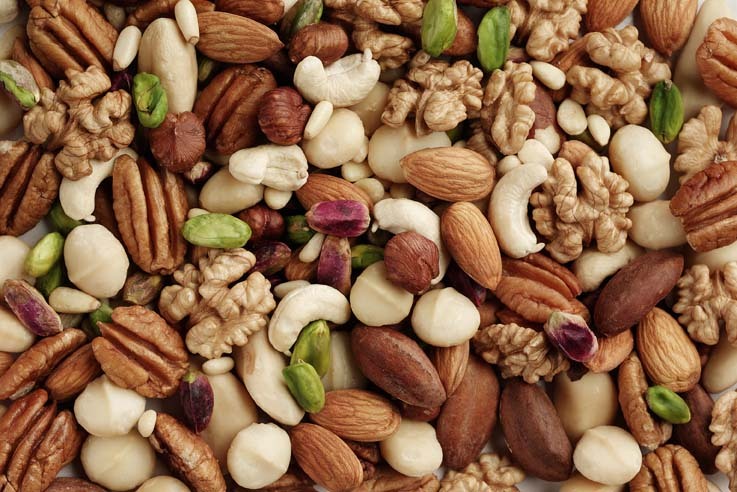 It turns out that heart-healthy fats like those found in nuts are really important to include in our diets. They increase satiety, decrease cravings, and help stabilize blood sugar. The New England Journal article “Association of Nut Consumption with Total and Cause-Specific Mortality” summarizes the health benefits of nuts– and there are a lot of them. This study followed 150,000 people over 2-3 decades of life and their results are eye opening. You might think, “Nuts are so highly caloric! Maybe I’ll live longer but I’ll gain weight, and isn’t that defeating the purpose?” It turns out that people who increase their nut consumption, even without actively trying to decrease their consumption of any other food, lose weight. The same goes for fruits, vegetables, whole grains and yogurt. 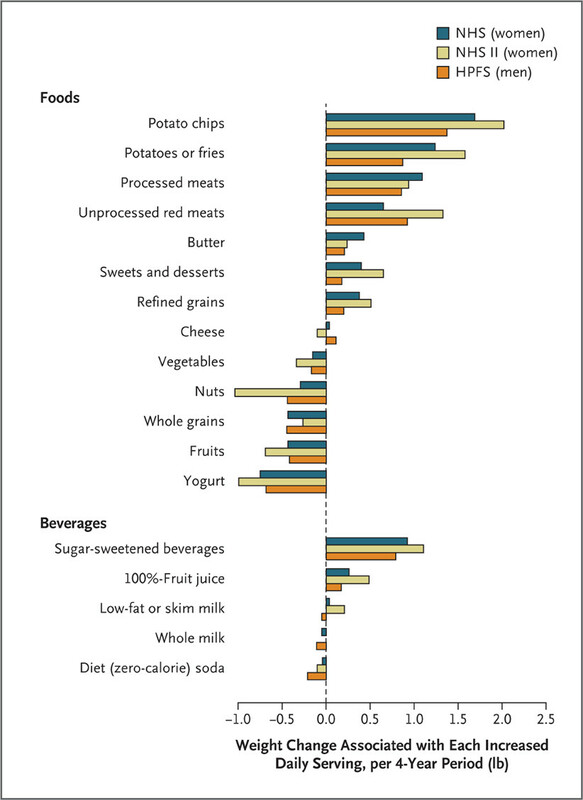 The chart below shows actual weight loss over a time span of four years when daily servings were increased. Typically people gain weight over time. But by increasing certain types of foods, people lost weight over that time period. As a doctor, I’m asking you to please eat more… of the good stuff. So next time the hangry monster within you awakens, why not reach for a bag of nuts? They’re easy, convenient, delicious, and minimally processed. They’ll make you a nicer, healthier, and happier person. Isn’t that something to go nuts over? Hi, how are you? What an interesting post. I have actually already shared it with pals. Next PostNext What is your Ikigai?